Brand new 6 BR / 5.5 BA home with private pool minutes from Disney! More than comfort, you'll find luxury and plenty of space in this brand new, two stories and modern decorated vacation home! With 6 bedrooms and 5.5 bathrooms, this spacious home sleeps 14 people comfortably. The first floor features a gourmet kitchen, living room, half bathroom and a mater suite with king size bed. On the second floor, you'll find another master suite with king size bed, 1 queen bedroom with en-suite bathroom, 1 Mickey themed bedroom featuring a full and twin size beds with en-suite bathroom as well, a Star Wars bedroom featuring a bunk bed and an Astronaut bedroom with 2 twin size beds. - teens and kids bedrooms are themed decorated adding much more fun for the kids vacation! You'll find a flat screen TV’s in each room. The open concept floor allows everyone to be together, whether you are cooking dinner for the family or just watching your favorite show on one of the flat screens TV. The gourmet kitchen is fully equipped with stainless steal appliances, granite counter top, breakfast bar and more! This beautiful villa has a large privacy screened deck and swimming pool area, chaise loungers, dining table and chair broil. The house features even a game room with Foosball and ping pong table. 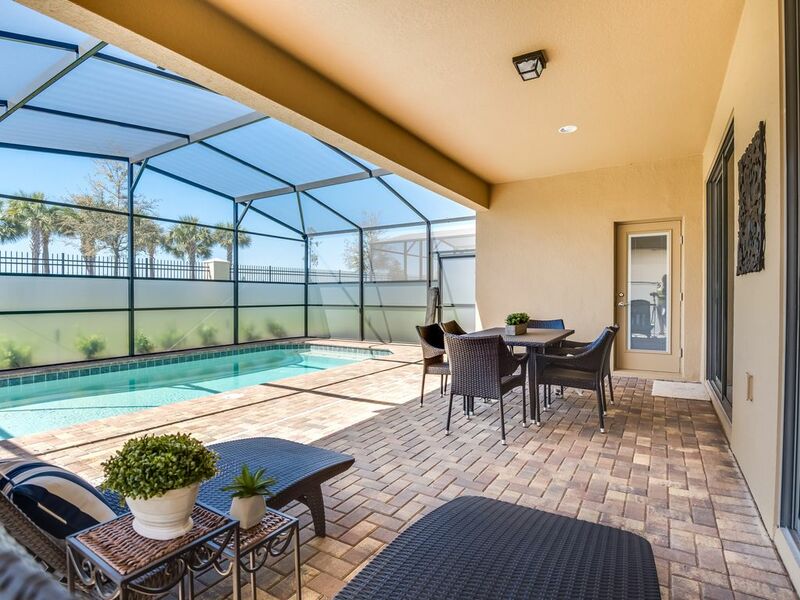 Located in the spectacular Windsor at Westside Resort, 10 minutes driving from Walt Disney World, this house is a perfect spot for your vacation! Fully equipped laundry with washer/dryer, free Wi-Fi and free parking are included along with access to the beautiful 10,000 square feet club house, resort style pool, lazy river, tiki bar, fitness center, sundry shop, video arcade and other amenities! Optional pool heat is available for $25/day + tax. We would recommend adding pool heat to your reservation between the months of November and April. Gorgeous new home with private pool. Plenty of space to relax and on suite bath rooms for almost every bedroom. The private pool even has the option for heat. The amenities of the resort were top notch and the staff was amazing. Overall great experience and I would definitely recommend/stay here again. Excellent, clean home. Casiola rentals are the best!! We enjoyed! Property was clean. Easy to get in and out. Pool was perfect bbq also. Had a great time. Enjoyed this so much! The house was beautiful and gave us plenty of space for everyone. Three sets of parents and five 14yr old boys all stayed comfortably. They enjoyed the game room and the pool a lot. Also, the neighborhood amenities were AMAZING. Massive community pool, lazy river, complimentary arcade, poolside bar and lounge for parents.... great fun! Location was great as well.... only 1 exit away from Disney theme parks. Would definitely stay again. Words can not express how much myself, and my family enjoyed our stay. The house is exactly as pictured. Looking forward to my next stay.